This weekend, we are wainting for you in various spots of Bucharest. Celebrating it @ The National Museum of the Romanian Peasant, @ Sala Palatului - V for Vintage FIESTA, @ PostModernism Museum. 1. The Night of the Museums @ The National Museum of the Romanian Peasant - Book Studio. Come to Book Studio to see some tehniques of making of manual paper. It is possible to learn how to make your own piece of handmade paper into your homes. In the Book Studio you will see the objects done by us untill now and the instruments which were used 500 years ago. We will make demos of manual paper and moulds of manual paper. The visitors will be distributed into groups. Each group will stay about 15 minutes in the studio. 2. The Night of the Museums @ V for Vintage FIESTA - Sala Palatului. V for Vintage is about Romanian Design and vintage culture. In the central hall, LUMINISH will expose lightening objects with folkloric motifs. Connected event: Dangale - Transylvanian cattle brands (signs) from the Saxon seats and districts, resembling Japanese ideograms. This handmade book contains the Cattle brands of 165 villages and towns in Transylvania, Romania. The illustrations are inspired by a archive book from 1826, of Carl Franz Koch. 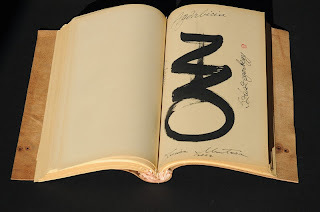 Unique handmade book, author – Lucian Muntean, 2012. Calligraphy, illustration, ink, watercolor, collage, 34 x 22 x 4 cm. Binding and cover – Răzvan Supuran, Atelierul de carte @ MTR, 2012. Japanese binding – body book, Coptic binding – cover, letterpress, engraving leather cover material – leather blacksmith’s apron. 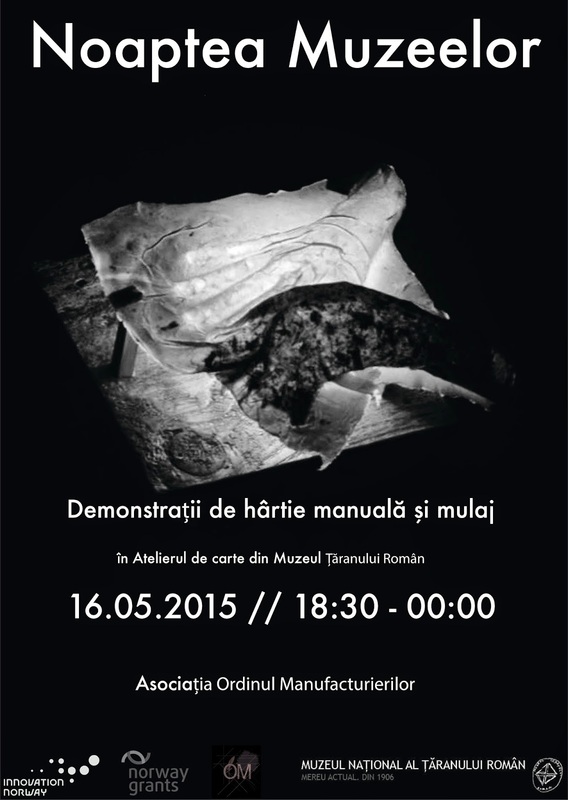 16 - 17th of May, from 10am to 8pm // Moulding workshop of manual paper. 18 - 21st of May, from 5pm to 9pm // Moulding workshop of manual paper. 22nd of May, from 6.30pm // Press Conference. 23rd of May, from 10am to 9pm // Exhibition. 24th of May, from 11am to 6pm // Exhibition. We will also participate in the Romanian Design Week Main event from the 15th of May to the 24th of May 2015 - Main exhibition at Hanul Gabroveni, 84-90 Lipscani Street. LUMINISH, a project of the Association of the Craftsmen Order, is supported by a grant from Norway through the Norwegian Financial Mechanism 2009-2014, in the frame of Green Industry Innovation Program Romania. LUMINUU. Hand in hand paper. True story. LUMINISH is conceived through body, paper and light. The letter is hermeneutics stemmed from mould and print, the book is monadic, the body of illumination ritually lights up at dusk. The manual paper generates, facilitates and translates their encounter. LUMINISH proposes an experiment with manual recycled paper of hands. 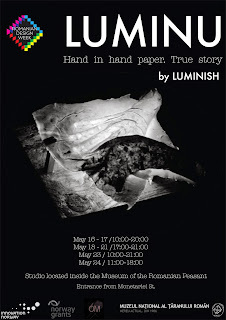 Every person who visits us may be a part of this experimental play by letting us mould his right hand with manual paper.Time of making: 15mins. After six days of moulding workshops , in the 7th, we will create LUMINU: all the moulds will put together into a colaj installation. As long as you make it you may break it out and re-make it. The hand shapes: writes, draws, paints, carves, makes paper. The hand comforts and nurshises. The hand experiences. It brings the stream of consciousness into materialization. So as long as the hand works, the mind meditates, the heart creates.The making, serenity and creation go hand in hand. The paper covers the hand. The potency of the creation is apprehended by the mould. The mould is anchored into an alfa and omega key object, breaking out and re-making. Vegetal epidermis is moulded onto the human one. Original play: the nature germinates, potentiates and creates. Second play: the man uses, recycles and re-creates.